(idiom) – referring to something as ‘the bee’s knees’ means that it is of excellent or very high quality. Furnish your home in style and on a budget! Many people are nervous about buying “second hand furniture”, but buying vintage and retro pieces is a fantastic way of furnishing your home in a style that’s completely your own and which reflects your personality. It’s also a great way of furnishing a home on a budget as this furniture is often a fraction of the cost of similar items found on the high street. Re-cycling or up-cycling is also great for the environment. 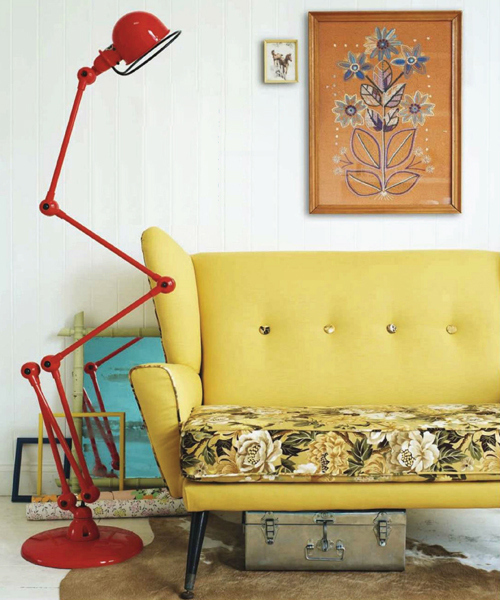 Not only that, but vintage homewares have become fashionable, sought-after, designer pieces. We believe that items with history bring individuality and life to a home. It’s also great fun hunting for vintage furniture and nothing beats the thrill of finding a real gem that you’ll treasure forever. So, how do you decide on the right piece, what price you should pay and where do you actually go to buy these pieces? You can find amazing vintage and retro pieces in any number of places. Auction houses, house clearances, and on-line sites such as Ebay, Freecycle or Gumtree are good places to start… If you have a weekend free, head off to your local car boot sale where there are bargains galore, or visit your local salvage yard. Second hand furniture shops in your area are also a great source for furniture. Get to know the staff and they’ll often keep an eye out for pieces and you get to hear about items before everyone else. Charity shops have also started to stock vintage furniture and they’re also worth scouring for accessories. It also amazes me what people will throw into a skip – as the saying goes, “one man’s trash is another man’s treasure”, but if you see something, always ask permission to take it away. Finally, there are a number of Vintage & Retro Fairs which are held regularly all over the country – here you will find a range of traders offering everything under one roof, plus it’s a great day out! It’s important to remember that you are not just buying any old furniture, you need to think about the look you want to create and an era that reflects this, be it the 1930’s, 1950’s or 1980’s.. Perhaps you love the psychadelic colours of the 1960’s and pop art or the soft curves and shapes of art deco pieces. The web can provide lots of inspiration as do homes and interiors magazines. To qualify as real vintage, items should be at least 30-40 years old. Anything later is second-hand and anything older than 100 years is considered antique. Before you go shopping for any item, consider the space in which it will sit. The size of rooms and the dimensions of entrance ways or the stairs are extremely important. Always take a tape measure with you – you will be spending hard-earned money for your furniture and there is nothing worse than finding exactly the right piece and then being disappointed because it doesn’t fit. I have learned this the hard way. I recently bought a beautiful teak sideboard during an on-line auction and then realised I actually had no way of bringing it home! My long suffering partner spent three days organising a roof-rack for his father’s estate car and we had to pray that it wouldn’t be ruined by April showers on the way home. Some sellers will offer delivery for a small fee, but always check first! Ideally you are looking for furniture with “good bones.” Generally, wooden items such as vintage tables, chairs, cabinets, dressers, chests of drawers and coffee tables last better than upholstered furniture. Just because it is old doesn’t necessarily mean that the quality is great. Try to avoid furniture made with inferior materials and with poor workmanship. ondition is the most important aspect in determining value. If you want to make sure your furniture is not going to fall apart in the next couple of months don’t buy on impulse. Instead, take your time and inspect each piece thoroughly. If it’s made of quality wood, with good joints and a good bonding glue you’re going to buy the furniture with confidence, not with fear. Condition is the most important aspect in determining value. If you want to make sure your furniture is not going to fall apart in the next couple of months don’t buy on impulse. Instead, take your time and inspect each piece thoroughly. If it’s made of quality wood, with good joints and a good bonding glue you’re going to buy the furniture with confidence, not with fear. Lean on tables and tip back chairs. If it’s a sofa make sure the frame is not altered and even extend it to make sure those metallic parts are working well. Examine furniture closely to check for live woodworm, damage or repairs. Drawers should run smoothly and frames should be sturdy. If a piece does have damage, consider whether you have the skills to undertake the repair and obviously any damage should be reflected in the price. This buy viagra without prescription is especially true of wooden or teak furniture. Wooden furniture can often be sanded down to remove layers of dark wood stain. In terms of teak furniture, there are a number of products on the market which can help – the staff at your local DIY store can be a source of great advice. And if it’s a truly iconic piece, you can always have it professionally re-finished – especially if you bought at a bargain price to start with.. If you find a beautiful Victorian armchair or a set of retro dining chairs that look past their best, don’t be put off. If you are shopping for vintage furniture which does need re-upholstering, be sure to build in the costs of fabric as it can be expensive. However, often it is still cheaper than buying a new armchair from high street retailers such as Laura Ashley or John Lewis and being able to choose your own fabric will make it a unique piece for your home. You don’t have to stick rigidly to pieces from one particular era or in one particular style. Creating interesting combinations is what adds character to your home. Different items in a similar mood can look better than trying to match everything together. In the photo below I love the mix of softer vintage pieces such as the glass lamps combined with the industrial furniture. Or, why not try an antique kitchen table with mis-matched chairs? This can look fabulous and can save you a small fortune.. Purchasing individual pieces that work well together is the perfect way to create you own style for your home. Vintage eiderdowns, crochet blankets and galvanised metal for the garden allow you to create a vintage feel. Ercol furniture is becoming increasingly rare as are names such as G-Plan. Don’t be put off by paying higher prices for such items as they will become investment pieces of the future. Industrial, shop and school furniture such as lockers are increasingly on trend. Buying vintage gives you the opportunity to really put your own stamp on things – so go forth and shop!